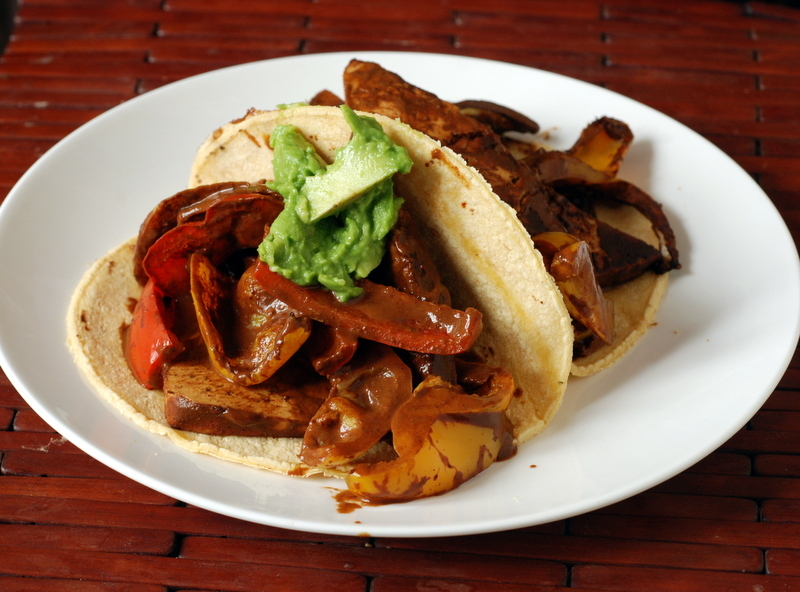 Matt’s note: Not too spicy,and full of flavor, cacao makes magic with Caribbean cuisine! Soybeans are full of isoflavones, the phytochemical that may be responsible for soybeans’ ability to lower cholesterol and reduce cancer risk. When you combine them here with cacao, you have a powerful phytochemical plate! 1. TO MAKE THE SAUCE: Blend together the sauce ingredients in a blender and set aside. 2. To make the tofu: Cut the tofu block into 4 sections and then cut each of these into 4 strips. Mix the tofu with the vegetables and sauce in a casserole dish or other flat-bottomed vessel and allow to sit for an hour. 3. Preheat the oven to 400 ̊F (200 ̊C, gas mark 6). 4. Add the tofu and bake, turning once, for 30 minutes, adding a bit more liquid if you need to or want this dish to be saucier. Increase the heat to broil and broil for 5 to 7 minutes to finish. What a novel recipe…I might be able to sneak it onto our family table if I don’t way what’s in it. My kids automatically equate chocolate with SWEET. I guess that means we don’t have an ‘unusual’ recipe with chocolate…about as adventure-filled as we’ve gotten, thus far, is chocolate-banana bread. I haven’t ever really tried chocolate in an usual way, but I’m so intrigued!! The idea of cocoa in chili has always piqued my interest, but I’ve never taken the leap haha. This tofu looks incredible and I am definitely going to give it a try!! Thank you for sharing that recipe: it sounds like it will be a great addition to my repertoire. I like baking tofu and tempeh in a sauce or marinade, but I sometimes find myself turning to the same flavours again and again. This one will make for a delicious change! I’ve been meaning to try cocoa in a chili, but I keep forgetting while I’m doing it. I’ll try to remember next time, because I’m really curious to taste the depth of flavour that it apparently lends to the dish. I’d really like to try making mole – I never have! I could totally understand that you’d get weary of so much chocolate, especially in savory dishes. This tofu sounds really tasty! Really, I’ll out my unsweetened cocoa powder in ANYTHING! I love chocolate covered almonds. Probably my favorite way to enjoy it! Thanks for posting this and the links, Janet (I have my eye on the tamarind chili). 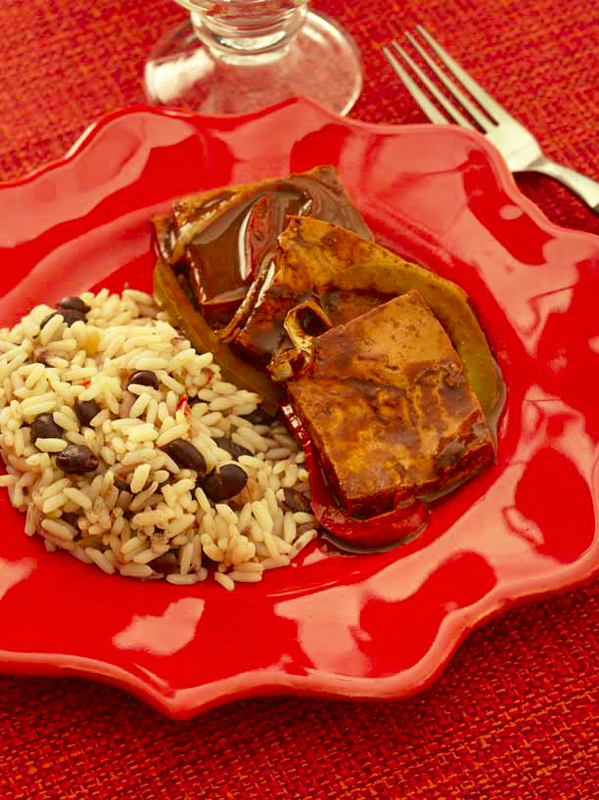 This recipe is kind of like a Caribbean mole sauce. Love the look of this recipe and all the others you’ve listed so now I REALLY WOULD LOVE to win it! I don’t get too crazy with chocolate but I do love it best when in less sweet, or even savoury dishes. I put a healthy dose of cocoa powder in my home-made taco seasoning. And sometimes in chilli sauce. Some times I mix it with cinnamon for my mid-morning coffee. Oh yes, wait a minute… I do have an “unusual” way of using chocolate! I do a fantastic “chocolate salami” every Christmas. Well actually I make it at the end of November and it “cures” till Christmas. This year I turned it into a chocolate “chorizo” by adding more heat and reducing the sweet content. That recipe is on my blog by the way, but I’m not here to talk about my blog, I’m here to win this book! 🙂 Thanks! I don’t really have any weird ways I enjoy chocolate, but I’d love some ideas from this book. I think the weirdest way I’ve had chocolate is a chili recipe with cocoa. i also don’t think i have a weird way to use chocolate. (oops!) i did once try it in chili, but i think i might not have used enough, cause i couldn’t taste it. this book sounds awesome! thanks for the opportunity! This recipe is SO up my alley! I love chocolate in hot dishes (chili, mole), and bet it would be spectacular here, too. I must give it a try! Interesting sounding cookbook! This dish sounds, I love the idea of infusing a bit of a choco flavour to savoury foods like this. Yum. Perfect valentine’s fare. Thank you for this recipe – chocolate and tofu! I enjoy adding cocoa powder to a spicy red lentil puree for breakfast. Just came back from Mexico where I bought several moles. Can’t wait to cook with them; absolute deliciousness! My favorite ways to eat chocolate usually just involve eating it straight up 🙂 But a couple more unusual ways I use it are in chilis and some sauces, like enchilada sauce. It’s not really identifiable as chocolate that way, but it does provide a nice flavor. I guess this is unusual to some people – I love chocolate bars with hot peppers. My favorite is Theo’s Spicy Chile Dark Chocolate. Yumm!! I don’t know that I’ve tried chocolate in an unusual way, but I look forward to trying a new recipe. I hope I’m not too late! I mostly only use cacao powder in smoothies with maca… I need some inspiration for sure! Hi Nicole. Not too late since I am late myself. Congratulations, you won. Please check your email. I wish I could have entered but I live in the UK, may have to put this book on my wish list 🙂 The round up will be up later tonight, thank you for sharing such as curious recipe.